July's Q&A features a sibling duo, Amanda and Kristopher (Kris for short), whom I've had the pleasure of knowing most of my life, primarily because our mothers went to high school together (in downtown Manhattan), and coincidentally, our families grew up in the same town in suburban Central Jersey. Now a stipulation about this awesome bro-and-sis pair -- they are arguably the most adventurous people I know, in both regards to food and outdoor activities. They'll be the first to try the bizarrest of foods in foreign countries as well as the first to volunteer ziplining through the jungle. Plus, they were groomed and bred by the man whom I consider the foodiest of all the foodies in my life -- their father whom I call Uncle Leon always knows the best places to go because of his incredibly discerning palate and meticulous tastes. As a family, you know they'll take care of you when it comes to things in the culinary arena. Anyway, Amanda and Kris both inherited their father's genes in this regard, always on the prowl for something good to eat, savor, and enjoy. You'll know they'll be at the front of the beeline to try something new, and they're not afraid to be open and frank about it. If it's delicious, it's worthy of praise; if it's just not good, they will say so. Amanda and Kris are both quality individuals who have impeccable taste in all aspects of life (including food, fashion, art, and design) and are two of the most generous people I've had the chance to be around. When I'm at a loss for where/what to eat, I know they'll always have something tucked up their sleeves that will blow me away. Thanks again to Amanda and Kris for participating in July's Q&A sesh! Kris and Amanda enjoying fresh mojitos at the Dream Downtown Hotel pool. Kris: Sushi of Gari. It was a one-time deal: a graduation gift from my godmother. She knew of my obsession with sushi and took me there for the most spectacular meal of my life. We ordered from the Chef's Special Menu which consists of five pieces of fish that change on a constant and daily basis. Each has its own sauce that is delicately placed in between the cut of fish and the rice. They don't even bother giving you soy sauce or wasabi, because the fish has enough flavor as is. I will never forget the meal -- the Chef's Special changes every day and there is no menu. You simply order it, and five pieces of fish are brought to you. We ordered five rounds a person, and each fish was uniquley different with its own special flavor. Save this for only special occasions because it is $10 for a single piece of sushi. Amanda: Alma de Cuba in Philadelphia. I stumbled across this charming place seven years ago while looking for a nearby jazz bar. This restaurant threw me off at first. As I walked down Walnut Street, one of the busiest streets in Philly, I saw this three-story, pale-yellow, colonial looking house, set between modern buildings. I found it peculiar and peeked inside, only to find contemporary fixtures, warm red lighting, and hot Latin music. To this day, I can't get enough of its bread (I know it's lame, but they are the most delightful mouthfuls of chewy, warm, fragrant goodness you'll ever have). Every time I head to Philly, I stop by for some ceviche, churrasco, and my must-have -- its signature Alma Colada, a blend of passionfruit juice, coconut milk, Bacardi superior and rum. Kris: For brunch, I hardly eat at the same place twice -- there are too many brunch places here in New York City. When I'm at work in Midtown, lunch means Dishes-To-Go. Then for dinner, I like to frequent Westville, Ippudo, The Meatball Shop, and The Stanton Social. If the night leads into a drunken stupor, late night drunk eats are Artichoke Pizza, Cafeteria, and the Halal Cart on 14th Street and Irving. 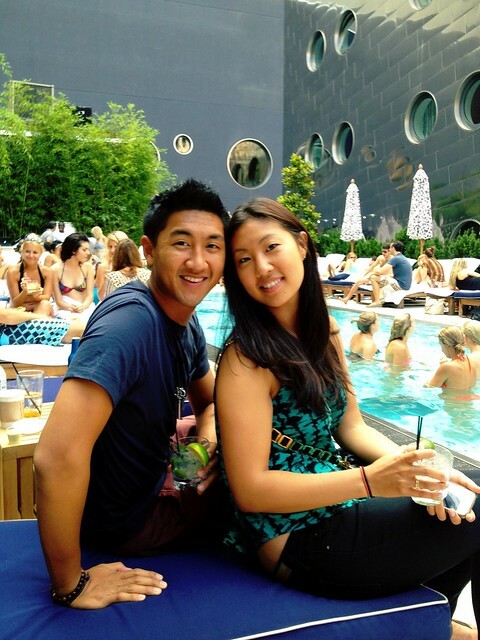 Amanda: In New York City, they would be Shake Shack, Sushi Samba, Joe's Shanghai, Tiger Bar, and Pinkberry. Kris: Any alcoholic drink that stems from a tea usually catches my interest, e.g., Chrysanthemum- or hibiscus-inspired cocktails. Amanda: Elderflower champagne cocktail, but when this isn't available, a classic mojito will do. Amanda: There are no secrets here! I frequently indulge in nocciola (hazelnut) gelato and/or Neuhaus chocolates. When I'm craving something savory, similar to my brother, I typically go for some sort of street food. I actually love doner kebabs (i.e., Turkish kabobs) and chicken and rice (with two lines of white sauce and two lines of hot sauce, please!). And of course, I will never pass on a chance to sip an ice cold India Pale Ale microbrew, with a side of chips or fries, of course. Kris: Hearty mashed potatoes with EXTRA butter. It's a holiday tradition that I've always enjoyed making for Thanksgiving and Christmas. It takes a lot of preparation time, and the ingredients are sure to give you a heart attack, but then again, it's tradition. Amanda: Well, I prefer to bake, so I love making cheesecake. I typically go for the classic recipe with a dash of cinnamon and nutmeg in the crust and a light drizzle of some fresh berry sauce. It's such a simple recipe, though I hate having to wait four hours for the cake will set in the fridge! If I'm in the mood to do some serious cooking, I enjoy making mushroom risotto. The risotto is somewhat time-consuming as you have to constantly add stock into the arborio rice, but I promise I put lots of love into that dish. Kris: I don't really know how to say it in English, but the dish Chinese pickled cabbage with slices of beef. Both my grandpa and mom always know to make it for me when I come home after being away for a while. It's sweet and salty, and the cabbage always packs a nice crunch. Amanda: Hmmm... I think this might be one of the toughest questions (following the words that will never lose their panache! ), because I always crave home-cooked food. It always changes, but at the moment I'm missing some bo-zai-fan (literal translation in Chinese for "clay-pot rice"). My dad cooks the rice first and when the water is almost evaporated, he adds a mixture of beef, some secret ingredients, soy sauce, and fresh cilantro. Once it's done, I love digging at the bottom to get the fan zeew (excuse my Cantonese pinyin right now, haha), i.e., the burnt rice at the bottom of the pot. Kris: As much as I would like to say a classic European destination known for its organic ingredients and traditional recipes (insert Paris or Tuscany), Hong Kong has always been filled with countless foods which I long for. Having studied abroad in Florence for a semester and traveling across Europe during that time, I came home to the U.S. without having gained any extra weight. That all changed shortly after during my two-month internship in Hong Kong. Every night was a hodgepodge of different Asian flavors, each one seemingly better than the next. To survive the high rent of Hong Kong, restaurants need to deliver, and that's just what they do. Whether it's a beautiful banquet hall or a food joint where you have to soak the chopsticks in tea to disinfect them, Hong Kong is my favorite place to eat. Amanda: I'm torn between South America and Southeast Asia. Growing up in a Chinese family, I am more accustomed to Asian food in general, so I think I might find more comfort in going to Thailand, Malaysia, Indonesia, Cambodia, and the Philippines. But then again, I also have a strong desire to head on a nitty-gritty, backpacking, culinary adventure through Peru, hopefully making a stop in Ecuador to try the home cooking of Mauro, my beloved former roomie from Spain. Kris: My father is a phenomenal cook; many people say their parents are, but I truly believe my dad is a special circumstance. I believe it stems from his humble beginnings as a child who looked at food, yearning for it, but could not afford it. So, now as a full-grown adult who can afford some of the finer foods New York has to offer, he is very selective and savors every flavor. He is hardly satisfied with a meal, and if he compliments a restaraunt, I automatically know if must be a fine one. When he was young, my father served as a bus boy to many of Chinatown's busiest restaraunts. He learned the secrets of the chefs and watched as they prepared meals for affluent customers. With that in tow, he has undoubtedly picked up recipes and ways of getting the best flavors from simple ingredients and spices. He can also prepare an entire meal in about fifteen minutes from start to finish -- a feat which I cannot possibly do. Amanda: I don't LOVE anyone wholeheartedly, but I do appreciate Anthony Bourdain. He has this carefree, frank, and open-minded attitude towards food, and it's refreshing. I watch his show all the time ,and I get a kick out of his ex-druggie, crazy personality. In terms of game-changing culinary success, I have to say I admire Ferran Adrià, the owner and chef of the now-shuttered elBulli in Spain. His menu is ever-changing and oh-so-inspiring -- it represents culinary innovation at its finest. If I ever won the lottery, and the restaurant was still operating, I would fly myself over there for my first meal as a multi-millionaire. Kris: After Chinese school on Saturdays back in New Jersey, my family used to go to this local Szechuan restaurant called King Palace. I remember distinctly its homemade beef stew, rice cakes, and scallion pancakes. It never got old. Unfortunately, it was run by a married couple, and the husband and main chef both became ill, so the restaurant is no-more, but the memory of it still remains as our weekly routine. Amanda: This one's easy -- while traveling through Andorra, my boyfriend, Martin, and I found this restaurant resting up on a hill in one of the side streets of La Massana. This restaurant is part of a chain of authentic Basque restaurants (Grupo Sagardi/V.O. ), but we can never remember the name. We ordered a magret de canard avec foie sauce, which came with a side of rocket salad. The duck was cooked to perfection, and that foie sauce was so rich though never felt heavy. I need this recipe! Kris: Two things: people who are unwilling to try new foods and people who still want to split the bill 50-50 when you order a salad and they order something like a filet mignon. Amanda: I'm going to have to agree with Kris on this one -- I can't stand people who are cheap and don't understand the meaning of reciprocity. Kris: Key lime pie from Key West. Amanda: Martin's Valentine's Day chocolate fondant! Even though his first attempt was made with salted butter rather than unsalted butter, it's still my favorite. Kris: I'm not a huge reader of cookbooks, but I am a person who tends to prefer cooking magazines for their seasonal nuances and constant change with current trends. Amanda: I don't use cookbooks, but if I did, it would be the one I'm in the process of making. I'm collecting family recipes from both sides of my family and will bind it to share with future generations. There's nothing that beats my coveted family recipes. Kris: I don't know what it is in English but when something is cooked with enough flame intensity, Cantonese adults always talk about the wok hai. Amanda: Ummm... all French culinary words? Anything said with a French accent just sounds so much more sophisticated -- maybe this is why I'm dating a French-Canadian. Kris: Four Tines and Immaculate Infatuation. Amanda: Well the obvious answer is Four Tines and a Napkin, but aside from that, I do find myself getting lost in the words and photos of Aran Goyoaga of Cannelle et Vanille. I am dying to take her food styling class! Stefie, if you haven't seen this blog yet, do check it out.